After following my blog for a little bit, someone sent me an email a few years ago suggesting that I should write a book. I laughed it off and basically said, "Thanks for the suggestion but I don't think so." However, it did plant a seed and eventually led me to where I am at today. Writing and sharing my book with the world has been a dream of mine since I was kid in high school but it was just that -- a dream. A dream I didn't think was possible but looking back I realized the only thing ever stopping me was me. The process wasn't always easy or fun but it has been worth it. Having people read my book and share their feedback with me has exceeded my wildest expectations. I don't know if you have a dream that you want to pursue but do it. 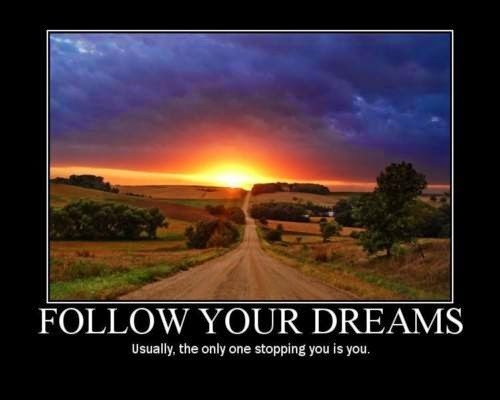 I'm here telling you to please follow your dreams and make them a reality. Turn those can'ts into cans before it's too late. Thanks for listening and thank you so much for support. Yes, we all have dreams and what we must remember is that our destiny - whatever it is - is in our own hands.